The need for a long walk was starting to make me “twitchy” so I sat down at the computer to work out a route. 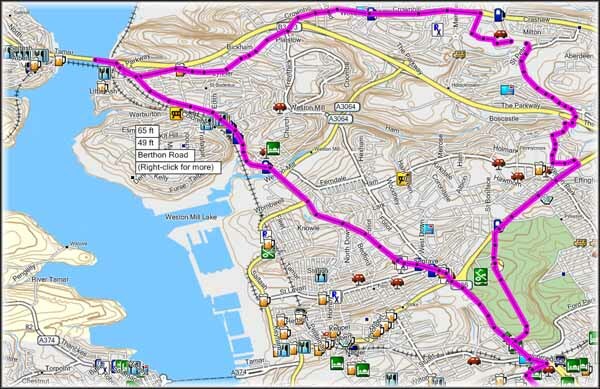 I normally use Garmin Mapsource and the City Navigator set of maps for Western Europe when planning a route. 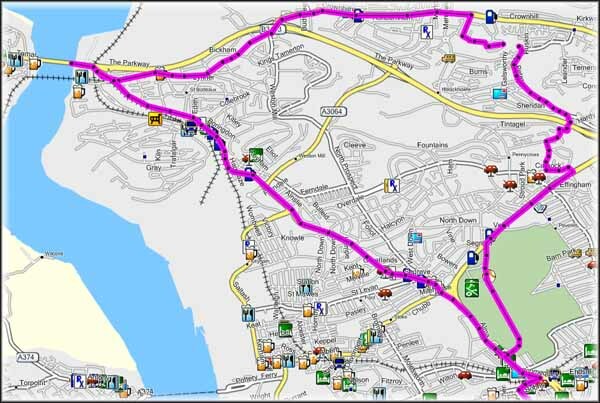 However whilst the City Navigator maps are good for travelling by vehicle they will not allow you to plot a pedestrian route. It is possible to plot a track using the UK topo maps available from the Scottish Mountaineering Club website. Incidentally, did you notice the difference between the two sets of maps. Yes; the Topo maps have the contour lines but did you notice the difference in the detail of the shoreline between the photos above and below. There is far more detail in the Topo map. However even the Topo map doesn’t allow you to see all the detail. To do this you really require an aerial photograph. This is where Google Earth is so useful. What I do is look at the detail in Google Earth and plot a path. Then I save the path as a kml file before converting it to Garmin Mapsource format using GPSBabel. Then I can transfer it from Mapsource to my gps unit. 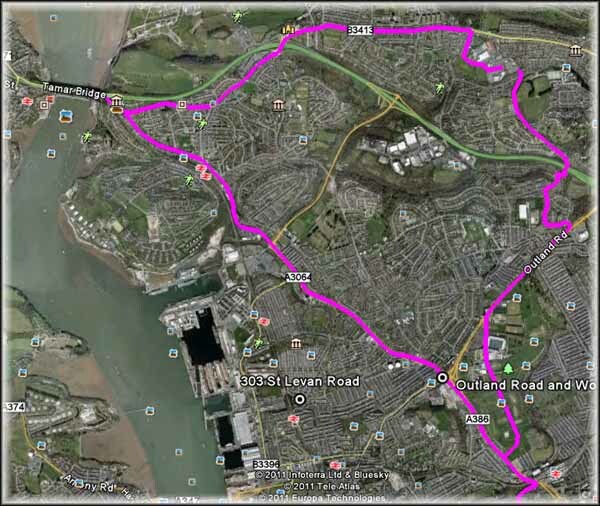 The purpose of the walk was to complete a 16km circuit which included the Tamar River. Initially this was to satisfy myself I had visited both Tamar Rivers. It was less than five months ago I was standing on the banks of the Tamar River in Launceston, Tasmania and I posted a blog entry about that visit <here>. My curiosity was pricked further when my research indicated the crossing included a very interesting rail bridge. 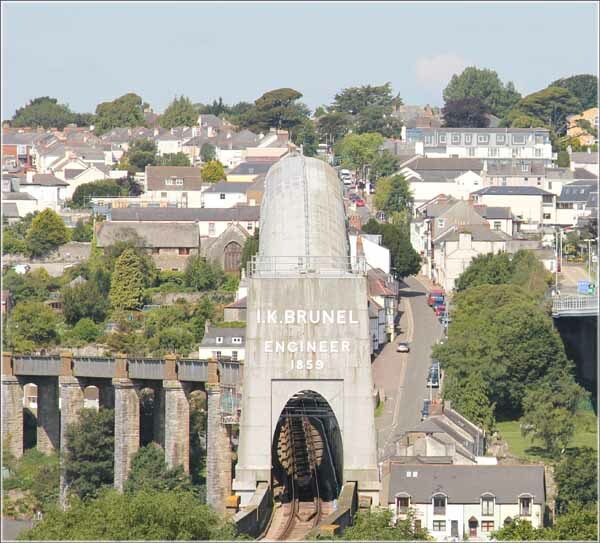 Isambard Kingdom Brunel designed this; the Royal Albert Bridge, which spans the Tamar River and joins Devon to Cornwall. What an interesting combination of Christian names. His father was french and had fled the Revolution. Kingdom was his mother’s maiden name. 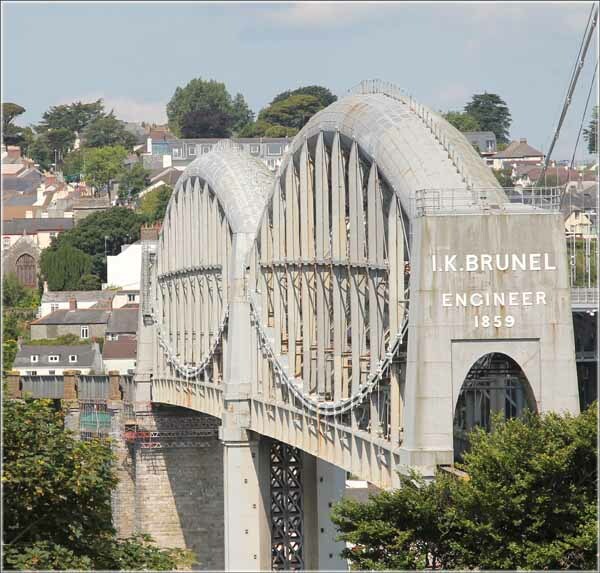 Isambard K Brunel was also the chief engineer during the construction of the bridge. After considering a number of options he decided on a two span bridge with a single pier in the middle of the river. He then adapted a diving bell designed by his father, sinking it in the middle of the river before forcing out all the water by pumping in compressed air. Up to 40 men at a time worked in the bell removing 12ft of mud and 3ft of rock before striking suitable foundation material for the pier. The double arch design of each pier looks far more interesting than the adjacent modern suspension bridge. Apparently on the far side of the bridge is a mysterious land full of little people sometimes known as pixies and goblins who live underground and eat strange pastries known as “Cornish Pasties”.